Fabbrica Nazionale Pistoni was founded by Pietro Gandini in 1914. Initially, the company specialised in the production of cast iron and steel pistons, and cast iron cylinder liners. Later on, light alloy pistons were introduced, as well as gudgeon pins and piston rings. Within a few years, the first workshop had become one of the most respected companies in its market sector. During the First World War, it was one of the larger suppliers of spare parts to the Army and the Navy, and, once the war had ended, it became a vital player in the burgeoning Italian motor industry. The factory was almost completely destroyed during the Second World War. Activities were re-established in Milan and Valbrona, in the province of Como, under the management of Pietro’s son, Ernesto Ugo Gandini, who updated the factory with modern machinery and new production systems. To take advantage of revolutionary die-casting systems, the factory introduced new aluminium alloys and heat treatment processes. As a result of this, it enjoyed tremendous success, and constantly increasing demand. By the 1960s, the company had a modern sales network, and its production was based on a range of more than 3000 sets of dies, which enabled it to produce more than 100,000 pistons per year. At the same time, in addition to pistons and cylinder liners of its own manufacture, the company had become the sole distributor for the Seeger range of special steel lock rings and clips, both the standard internal and external type, and the vast range of patented special clips. By this stage, Gandini was a Limited Company, and Piergianni Gandini, son of Ugo, became the third generation to lead the company. Under his determined management, Gandini has become one of the best known participants in the market. European makes of solid and flexible pins, belville washers, locking devices, and small plastic components, all under the general heading of fasteners. 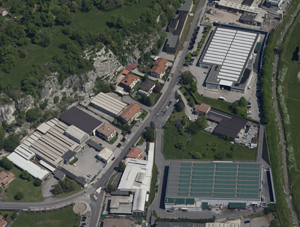 The takeover of Andit (former Anderton Italia) located in the hinterland of Milan contributed to extend the range of fasteners and to strengthen its presence on the market. One year later, it took over a factory of screws and bolts, thus giving rise to the sector of machining. In this year, the first new building at Canzo was joined by a second, and construction began on the third, in close proximity to the other two. The process of modernising productive systems continues, with major investments at the initial stage of the production process, in the form of a new foundry. This enables Gandini to increase its production, while specialising in the supply of compressor pistons,and becoming suppliers to the best-known Italian and European manufacturers. By now, there are more than 100 employees at the Canzo and Milan plants. The tool store, complete with historical records holds more than 10,000 different tools. We produce more than 2,000,000 finished pistons a year. This figure will soon reach 4,000,000. In 1998, Andit Automazione was set up. It became the Italian distributor of leading trademarks in the sectors of automation, welding, thermal cutting and robotics. 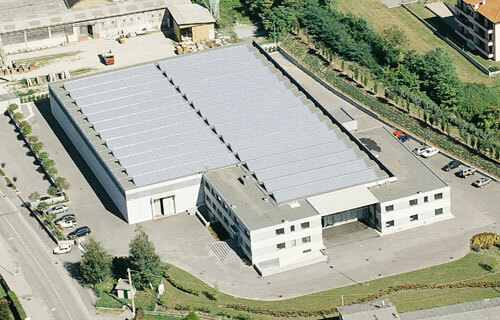 With the increase in turnover, staff and warehouse stock, amounting to a European record of more than 500 million ready-to deliver parts, it was time to move: the new managerial and commercial offices in Sesto San Giovanni, with a total floor area of 12,000 mq, have allowed the commercial division to be reorganized; the new computerized warehouse makes logistics procedures quicker and increases the capacity. The fourth "Gandini generation" started to work for the company: Stefano in the Fasteners Commercial Division and Alessandro in Administration and Finance. New strategies were pursued for the reorganisation of the group, i.e. the discorporation of the industrial division, the incorporation of Gandini Industria srl and Andit spa's merger through incorporation in Gandini spa. The setup of the 3rd factory, over 5,000 sq.m. with the new foundry completely robotised, enhances and extends Gandini Industria's production capacity.